This sleek men's watch from Citizen is powered by their innovative Eco-Drive technology. Utilising light energy, the battery never needs replacing in this timepiece. 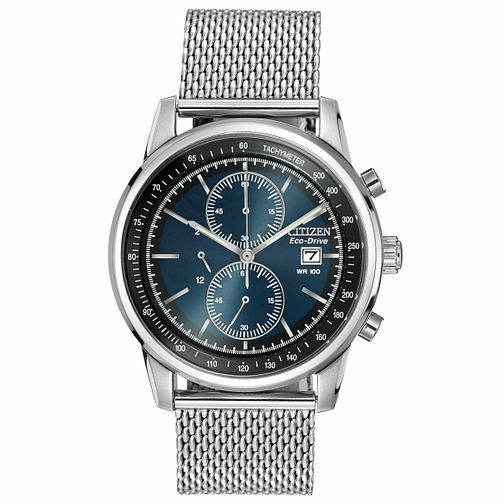 A cool blue dial is complete with a handy date window is set within a stainless steel case and finished with a distinctive mesh bracelet. Citizen Eco-Drive men's stainless steel mesh bracelet watch is rated 5.0 out of 5 by 1. Rated 5 out of 5 by Anonymous from Great watch This is a nicely styled watch and like all citizens well made and with eco drive.the mesh bracelet looks really good and the blue face gives it a modern sophisticated look.